I guess it's time to make a comparison between Chin Well & Tong Heer. I have been dragging for too long to write a post regarding this matter. As written in earlier posts, both groups also enjoying higher demand from their products as seen from their better performance result since last two three quarters ago especially Tong Herr group. For the trailing 12 months, Tong Herr managed to record higher revenue than Chin Well but lower operating profit and net profit compare to the latter. Chin Well managed to control its profit margin very well, better than Tong Herr did. I guess their raw material cost is roughly the same. Higher value products and lower operating cost contributed to Chin Well's higher gross profit margin and operating profit margin. Both group also in net borrowing position. Tong Herr has higher net gearing ratio compared to Chin Well. However, Chin Well's net gearing ratio probably will become higher after the recent acquisitions. Cash conversion cycle for Tong Herr group is better than Chin Well. Chin Well mentioned they need to keep a considerable amount of inventory in order to deliver the products to their customers at the shortest lead time. Minority interest percentage of Tong Herr group is higher than Chin Well too. ROE and ROIC of Chin Well is better than Tong Herr although both companies also considered as mediocre based on the return performance. Both companies' free cash flow generability also quite good with FCF/Sales and FCF/Invested capital more than 5% with Chin Well recorded better. 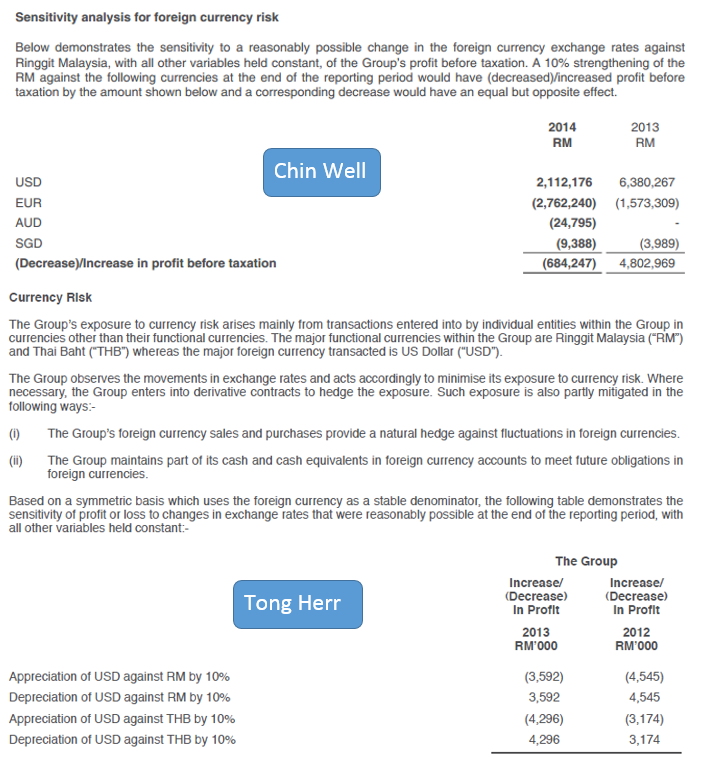 In terms of currency risk, the strengthening of USD against RM had greater impact on Tong Herr compared to Chin Well. Both groups' borrowings also denominating in USD currency but Chin Well has higher portion of trade receivables and cash denominating in USD currency as hedge. The impact is higher for Tong Herr in terms of percentage to the group's bottom line as Tong Herr's net profit is lower. It's noted that Chin Well also selling wire products apart from its core fastener segment. However, fastener segment contributed most to the group with around 85% and 96% respectively to the group's revenue and operating profit. Part of the revenue from its fastener segment came from its 60% owned Vietnam plant which soon to be fully consolidated after the acquisition end. Tong Herr has an aluminium extrusion plant in Penang apart from its core fastener business. In terms of contribution, fastener segment contributed around 70% to the group's revenue and operating profit. Although the aluminium extrusion segment contributed around 30%, but it's noted that Tong Herr only owned the extrusion plant for 51% only and part of the revenue from its fastener segment also came from its 50.01% owned Thailand plant. Besides, Tong Herr's associates, steel mill was still in red in FY2013 but managed to record profit in FY2014. Thus, if the demand of fasteners is improving, it will benefit Chin Well more as the contribution and PBT margin for its fastener segment are higher compare to Tong Herr. In terms of valuation, Chin Well PE ratio and DY are slightly higher based on trailing 12-month result compared to Tong Herr. Tong Herr may declared another dividend payment for the latest financial year due to better result. PBIT/Entreprise value ratio and FCF yield for both companies are roughly the same. I choose Chin Well because of its acquisition, higher margin for fastener products, improved production efficiency, higher value products contribution (DIY), new products from wire products, benefit from GST tax implementation, better growth prospect and lower exposure to currency risk. One thing to take note is the progress of the anti dumping duty imposed by EU.